As many of you know, this has been a driving summer . . .
Not commuter miles but trips that included LONG days. So think about this driving analogy. My trip to Sioux City today. When to stop / break / gas? Can I beat the GPS arrival time? By Des Moines, I had gained three minutes according to the GPS. And then semi-trucks passing semi-trucks going uphill . . . slowed both lanes down. And then there was road construction with one lane of traffic and a reduced speed limit of 55 mph. Considering overall rates of travel and the amount of travel in both lanes. So the short part of this is that I arrived one minute before my GPS said and my route, although with some adjustments, was successfully completed. What if ? ? ? Have you made the inference about where this is headed? . . . I forgot the Planning that happened prior to the trip including checking for my registration, insurance card, and having the car serviced (oil change & tire rotation) prior to the trip as well as googling the distance from point A and B so I could begin to draft the specifics. All of these little details matter when driving a motor vehicle. There are big details that have life or death consequences like safely managing a vehicle, keeping it in the right lane, accelerating and decelerating with traffic flow, smooth lane changes WITH a turn signal, safe distances between vehicles, and paying attention to merging lanes, road signs, and . . .
I’m lucky because I’ve been driving for over four decades and I had a refresher when my son would point out driving errors while he was in a driver’s education course. Your driving experience may include more total miles or more city miles than me. That’s a “number” or data-based comparison. But what about “quality”? In my opinion it all boils down to “my confidence in my driving abilities” because I have experienced a wide variety of situations that have contributed to the automaticity of my driving habits and patterns that also allow me to be responsive and THINK when I must make “in the second/minute” adjustments. I very deliberately chose this comparison because this “automaticity” is what we want for our students in reading. How will we measure this success? WHEN will a reader be successful? And what does this mean for TEACHERS, the adults in the classroom? They must be equally prepared, confident, and ready for challenges. That is why I am in several book clubs this summer. Probably too many. But I am pushing my own Planning, Questioning, Reflecting and Synthesizing especially as I work through professional books. I wrote about the beginning of #CyberPD and Vicki Vinton’s Dynamic Teaching for Deeper Reading here. This thinking fits with a Facebook and Twitter study of Disrupting Thinking by authors Kylene Beers and Bob Probst. Margaret Simon wrote about both of those today here. As discussed at the last #G2Great chat with Linda Rief, Reading is about the meaning that the reader understands as a result of his/her transaction with the text. Reading is NOT extracting factoids. on their own (P,Q,R,S) in real authentic work (not just school work), they WILL BE Skilled, Competent, Strategic, Confident, and Experienced Readers! What do you do daily to help students “transact” with text in the form of stories, books, poetry, nonfiction, art works, video, and audio? How will you know when students have reached automaticity? How will you know your students are skilled, competent, strategic, confident and experienced readers? #DigiLitSunday: More posts from Margaret Simon and Reflections on the Teche. #ILA15: One Week and Counting! This summer is a FEAST of professional development for me. I had the great fortune of being accepted for two weeks of learning at TCRWP for Writing and Reading Institutes. (You can check out my public learning log under the “Recent Posts” at the right.) 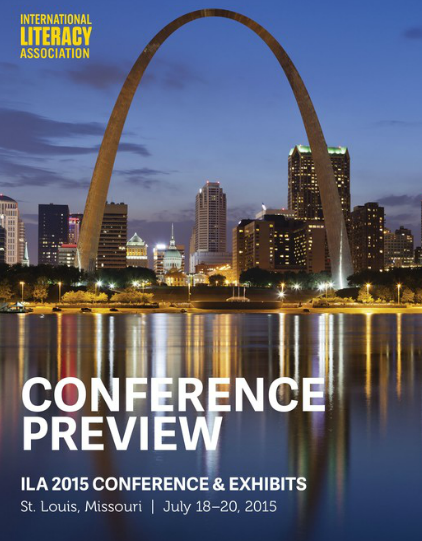 Next weekend I will be in St. Louis for ILA. How are you preparing for your learning? What information do you need to KNOW before you look at specific sessions? Do you look for specific PEOPLE? Do you look for specific TOPICS? Here’s the link to the 16 page preview guide pictured above. I used the search tool to create a DRAFT LIST of those I know that I MUST see. Tammy Mulligan and Clare Landrigan – They are authors of the book Assessment in Perspective: Focusing on the Reader Behind the Numbers. Kim Yaris and Jan Burkins – They are the authors of Reading Wellness. Check out a bit of their work here. Kylene Beers and Bob Probst – Notice and Note and Nonfiction version to be out in October. Other faves that I hope to see at ILA15 include: Vicki Vinton and Dorothy Barnhouse – What Readers Really Do; Dr. Mary Howard – Good to Great; and ANY and ALL TCRWP folks! Any Two Writing Teacher Slicers? – please say hello in person!